We’re in the unique position of making systems smarter in order to make people smarter. When the programs we use become more intelligent, so do we. When anyone can access these intelligent programs—even students with disabilities—our learning environments become more robust and can boost the potential of every learner. So it’s not just about creating the next best STEM course—it’s also about creating opportunities for every individual seeking an education. At NCLab we care about students with disabilities and special needs. Our courses work extremely well for autistic students, hyperactive students and students with limited mobility. And soon, all of our courses will be available to vision-impaired students as well. We’re not quite there yet, but the road map has been drawn and the challenge is currently being met with progress. NCLab’s CEO, Pavel Solin, has made a commitment to learn Braille by the end of 2017. 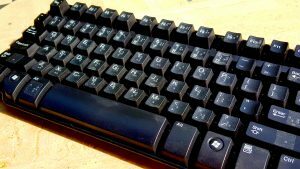 Take a look at Pavel’s Braille-friendly keyboard. Seeing students have a relatively simple time learning Braille symbols. The symbols resemble Morse code—each letter is expressed in a 3 x 2 matrix (3 rows and 2 columns) of dots, and each dot can be “on” or “off,” resulting in 64 possible combinations (26). 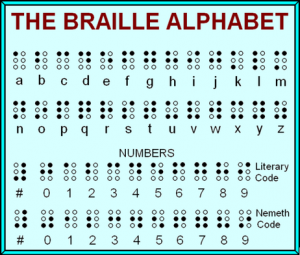 This allows for all 26 letters of the English alphabet, single-digit numbers, and other special symbols and words.